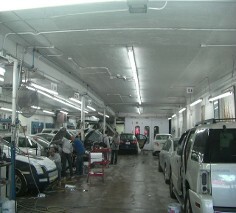 Come to Don Joe Auto Body for dependable auto body service and repair. We are located in Great Neck, New York, and serve customers throughout Nassau and Queens. We want to make your trip to Don Joe Auto Body as worry free as possible. One of our trained staff members will walk you through the entire claims and repair process once we assess your vehicle’s damage. For your convenience, Don Joe Auto Body will help get you a ride home or secure an automobile through Enterprise Rent-A-Car™, which is located on-site. You can see the pride we take in our work from the moment you enter our facility to the time the work is completed. Our managers provide a detailed inspection, ensuring that the proper care is taken throughout the process. We offer a lifetime guarantee on all repairs, so take the time to stop in for a free estimate and see how Don Joe Auto Body will exceed your highest expectations. At our shop, every vehicle is repaired in our state-of-the-art collision repair facility in alignment with factory specifications. We ensure that your vehicle is repaired properly and restored to pre-accident condition in no time with our car-o-liner frame and uni-body repair equipment and computerized evo-measuring system. Our highly skilled I-Car certified technicians use only the highest quality equipment, parts, tools, and materials for all of your auto body repair needs. We take pride in all of our work and believe your safety is our top priority. Our state-of-the-art spray booth and DuPont™ computerized color matching system ensures our finish is applied in an uncontaminated and environmentally friendly space. We utilize DuPont’s computerized color matching system and input each vehicle’s VIN number to select the proper color. The color is mixed conveniently on our premises. After painting, we add a polished finish to match the OEM clear coat, leaving the repairs virtually unnoticeable. Each vehicle we service will never leave the premises without a full-service hand car wash and mini-detail. Contact us in Great Neck, New York, to request a collision repair for your vehicle.